There's four ranges for this year: they'll be offering the P for fashion and design, G for best in class value, Y for accessibility and quality and D for bleeding edge tech, the last of which we've already heard about! Huawei's update to their P-series is finally with us and this time it's another solid device. There's a 720p 4.7" IPS display which is one of the highlights of the device! It features some new things such as 'HD In-cell tech' which should make it easier to read outdoors, there's 85-degree viewing angles, 500nit brightness. Huawei were content to offer a 720p display because the ppi remains above 300, 315ppi to be precise, the full justification for that decision is available here. The display is also 'infinity edge' which to all intents and purposes means that it's an edge to edge display and with that much screen on show it's reassuring to know that the screen will be well protected with a coating of Gorilla Glass 2 and there's a final nice touch through a feature called 'Magic touch', this will basically let you use the P2 even if you're wearing gloves! Outside of the screen there's a 1.5GHz quad-core processor, 1GB of RAM, 16GB of internal storage and a 2240mAh battery (which has special charging options which should speed it up) all of which they crammed inside an 8.6mm thick profile. Huawei said that the device would've been thinner if they hadn't squeezed in the new camera. So the extra size can be attributed to Huawei's new 13-megapixel rear-facing camera. The sensor is Back Side Illumminated (BSI) which should help in low light conditions and it has HDR capabilities in both photos and videos. Thankfully Huawei included a dedicated camera button so you can make full use of that nice sensor and on the front the camera is a 1.3-megapixel option. The rest of the phone features your normal array of connections, including NFC, and the final treat that comes with this phone is that it is the, "first smartphone in the world that support LTE Cat4." That means that you can download data at theoretical speeds of 150Mbps! "[A] UniHome function combines home panels with the main menu, while Huawei's patent-pending Me Widget better utilizes screen real-estate by combining all the information and functions you need in a single, customizable widget. Emotion UI is also pre-installed with a smartphone housekeeper function to support real-time data traffic tracking, automatic blacklisting and blocking, periodical system cleaning, and spontaneous exiting of idle programs and cache clean-up, in addition to anti-virus, energy saving, privacy protection, software management, and more." Huawei will also throw in their Cloud+ service to help back up and sync your files and Huawei Air Sharing which can share information between phone, "Pad" and TV, so it's almost like iCloud, indeed Huawei said they were very impressed by what Apple had worked on and achieved so that is undoubtedly where they got their inspiration! If you're interested in this device you can pick it up in either black or white, it'll set you back 399 euros and European availability will begin in Q2! There's a little promo video embedded below for your enjoyment! A big part of Huawei's hope for this device rests on their new partnership with Orange in Europe; the P2 will be available on Orange France in June 2013and the ultimate aim of this collaboration is to help Huawei build an improved brand in Europe. "We're pleased to be working with Huawei again to enable our customers to have easier and faster access to all their favorite content... We are impressed by the design and look forward to putting the Ascend P2 into the hands of consumers as soon as possible." 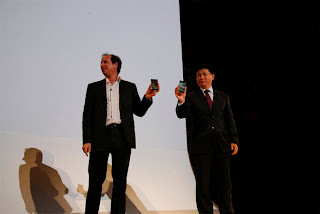 Barcelona, Spain, February 24, 2013: Huawei, a leading global information and communications technology (ICT) solutions provider, today introduced the HUAWEI Ascend P2, the world's fastest smartphone, at the 2013 Mobile World Congress (MWC). The Ascend P2 features a 1.5 GHz quad-core processor and LTE Cat 4 providing an ultrafast web experience with download speeds of up to 150 Mbps. Continuing the fashion legacy of the Ascend P-series, it is only 8.4mm slim with an infinity edge 4.7-inch IPS HD in-cell touch display with second-generation Corning® Gorilla® Glass, and will be available in black and white. "Ascend P2 is the perfect combination of elegance and power, and further proof that there's no need to compromise when desiring a perfect smartphone. It is evidence of the outstanding smartphone experiences and great technology that we are committed to bringing to consumers globally," said Richard Yu, CEO of Huawei Consumer Business Group. "We're pleased to be working with Huawei again to enable our customers to have easier and faster access to all their favorite content," said Yves Maitre, Senior Vice President, Mobile Multimedia & Devices, Orange. "We are impressed by the design and look forward to putting the Ascend P2 into the hands of consumers as soon as possible." "The technological capabilities of the HUAWEI Ascend P2 will enable our customers to have the fastest access to all their content, with speeds up to 150 Mbps on our brand new 4G network," said Florence Paour, Device Marketing Director, Orange France. The HUAWEI Ascend P2 runs on the Android 4.1 operating system, with Huawei's own Emotion UI 1.5. Powered by a 2420 mAh battery and 1.5 GHz quad-core processor, the Ascend P2 downloads HD movies in minutes, and loads online videos, web pages, songs or e-Books in seconds. Huawei's proprietary 'swift sharing' supports uploads and downloads two to three times faster than other smartphones in a Wi-Fi environment. With its NFC module*, Ascend P2 enables e-payments and can act as an electronic ticket. Huawei's unique Quick Power Control (QPC) and Automated Discontinuous Reception (ADRX) power-saving technologies, reduces power consumption by 30% and charging time by more than 25% compared to other smartphones. Continuing the fashion focus of Huawei's Ascend P smartphones, HUAWEI Ascend P2 evokes the image of an infinity pool with its seamless, elegant design and curvy contours. Using in-cell technology, its LCD 4.7-inch IPS HD touchscreen is an impressive 8.4mm slim. Its 'magic touch' feature provides enhanced screen responsiveness even with gloves, and instant keyword translation and Wikipedia searches can now be done on a single window with 'smart reading'. The screen also calibrates its brightness automatically under any light conditions, allowing users to perform any function, under any light. The HUAWEI Ascend P2 provides optimal photo and video features including a 13 MP BSI rear-facing camera with HDR, and a 1.3 MP front-facing camera to support self-portrait and video shooting. A dedicated camera key on the side of the phone also allows instant access to picture taking, click once for the camera to be activated and another time to take the shot. With Huawei's advanced camera algorithm, high-definition images can be captured even in backlit conditions. Auto adjustment modes further enable Ascend P2 to produce photos that rival professional cameras. The Huawei Emotion UI*, available on the Ascend P2 is easy to use and customize. The UniHome function combines home panels with the main menu, while Huawei's patent-pending Me Widget better utilizes screen real-estate by combining all the information and functions you need in a single, customizable widget. Emotion UI is also pre-installed with a smartphone housekeeper function to support real-time data traffic tracking, automatic blacklisting and blocking, periodical system cleaning, and spontaneous exiting of idle programs and cache cleanup, in addition to anti-virus, energy saving, privacy protection, software management, and more. As at the end of 2012, Huawei's products and services are deployed in over 140 countries, serving more than one third of the world's population. Huawei has also set up more than 20 R&D centers around the world in countries such as the United States, Germany, Sweden, Russia, India, and China. Consumer business is one of Huawei's three business groups offering a range of products that include mobile phones, mobile broadband devices, home devices, clouds, and consumer chipsets. With more than 20 years of rich business expertise in the information and communications technology (ICT) sector, an extensive global network, vast global business operations and partners, Huawei Consumer Business Group, through Huawei Device, is dedicated to bringing the latest technology to consumers, offering a world of possibilities and creating extraordinary experiences for people everywhere.